Wondering where to head to for your next winter family ski trip? Take your pick of European destinations, Austria, Switzerland, France, Italy, Andorra …. the choice is huge. Today we focus on a small resort at the end of the famous Chamonix valley in the French Alps. Les Houches is one of five ski areas in the famous Chamonix valley in the French Alps. 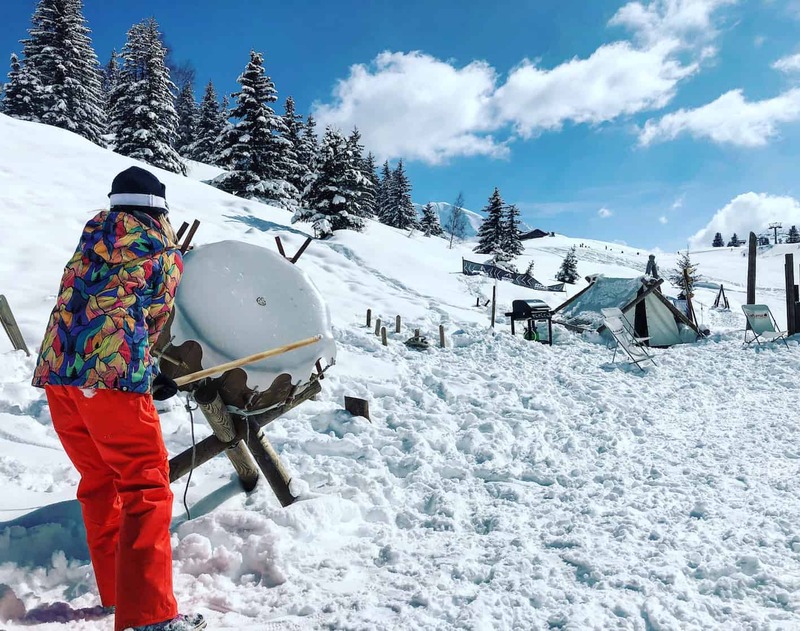 Known for it’s family friendly vibe with it’s wide open mellow pistes, Les Houches is often under rated next to Chamonix’s other steeper mountains. 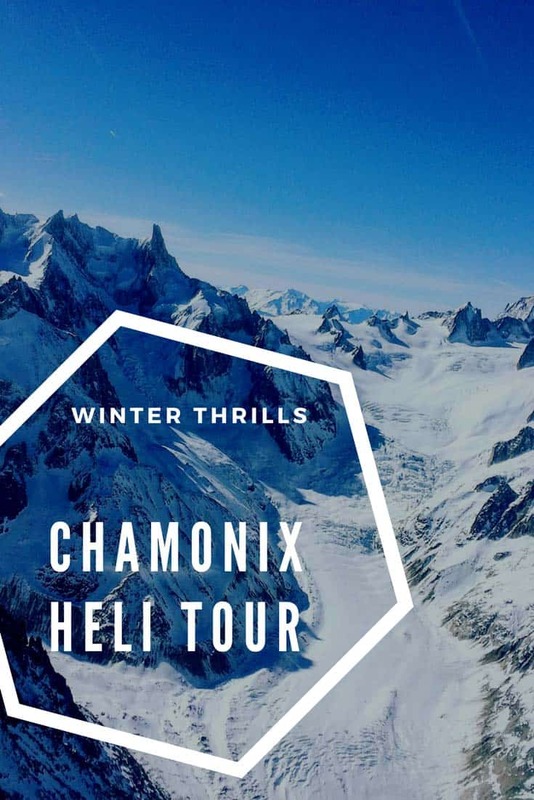 Head here with the family to enjoy broad sweeping, blue and red graded pistes or in bad weather to access the best ski runs in Chamonix on closed in, white out days. 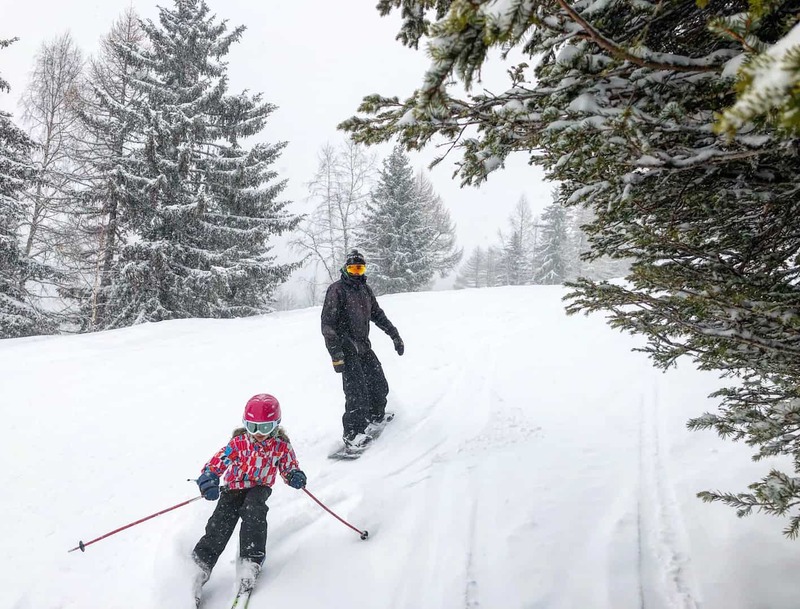 Les Houches is one of the best family ski resorts near Geneva with only a one hour transfer time. Find out everything you need to know about this ski area in our Les Houches review. 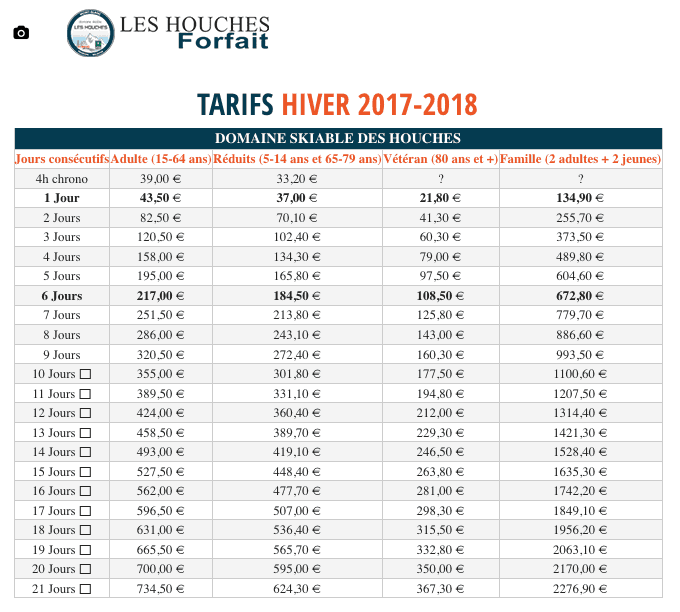 How much is a Les Houches ski pass? How far is Les Houches to Chamonix? To whet your appetite, watch this video about Les Houches. The village of Les Houches sits at an altitude of 1008 metres. 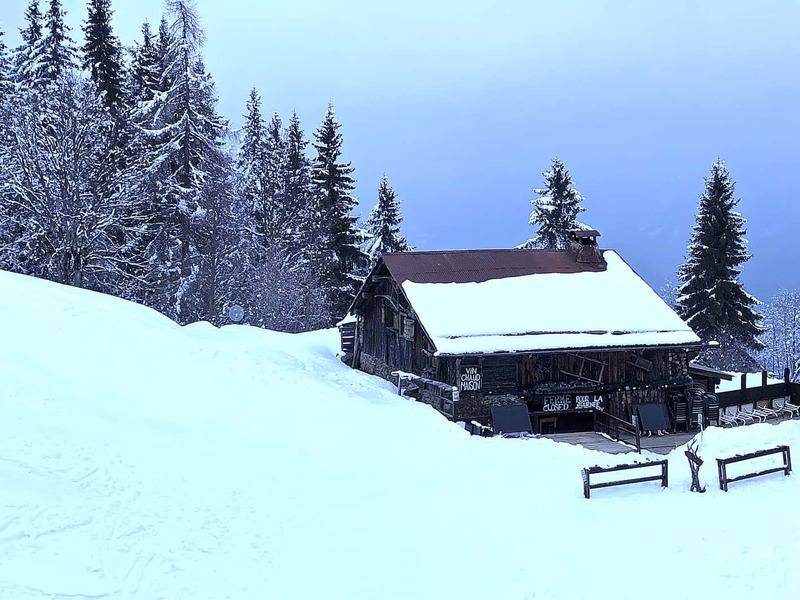 It’s the lowest ski resort in the Chamonix valley and the first ski resort you’ll reach as you drive up and enter the valley from the motorway. 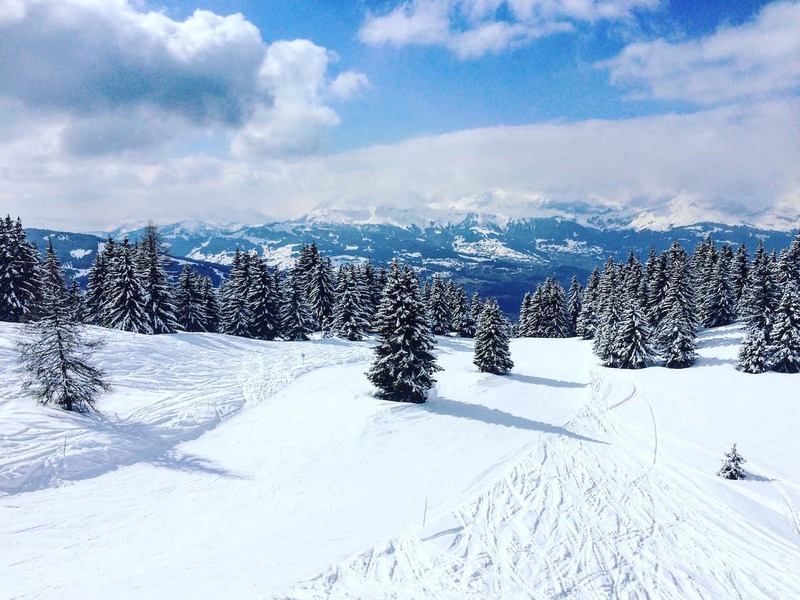 The Les Houches ski resort, with over 55km of beautiful tree lined runs, stands at the foot of Mont Blanc offering a spectacular backdrop to your ski day. With a multitude of easy graded slopes and it’s non-inclusion in the Cham ski pass (the pass that covers the whole of the Chamonix valley except Les Houches) Les Houches does, however, have its advantages. Die hard extreme skiers who flock to Chamonix don’t bother with Les Houches, meaning this fantastic ski resort has a lovely mellow vibe with none of the attitude often displayed in Chamonix’s other ski areas. 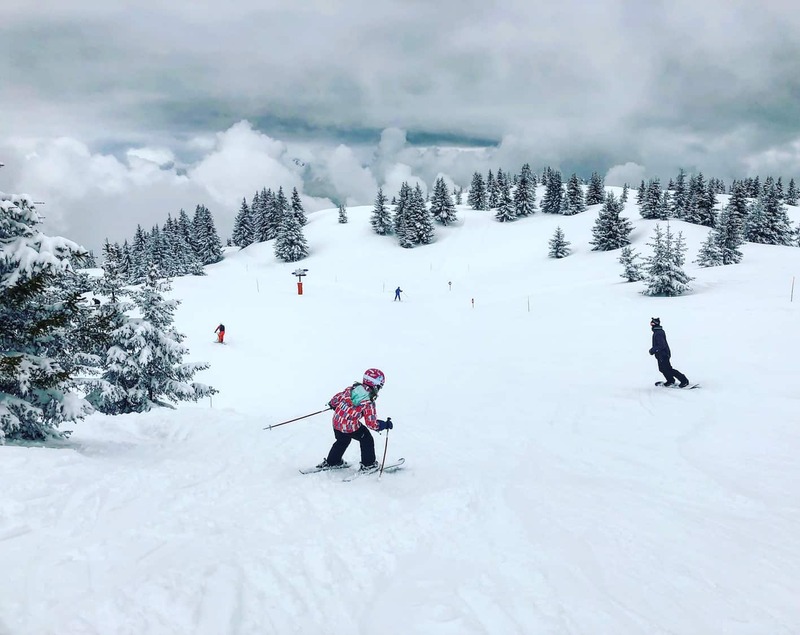 Perfect for families with it’s wide open, blue pistes and it’s dedicated kids SKI CAMP play area, it also has enough reds, twelve in total, to keep intermediate skiers happy. 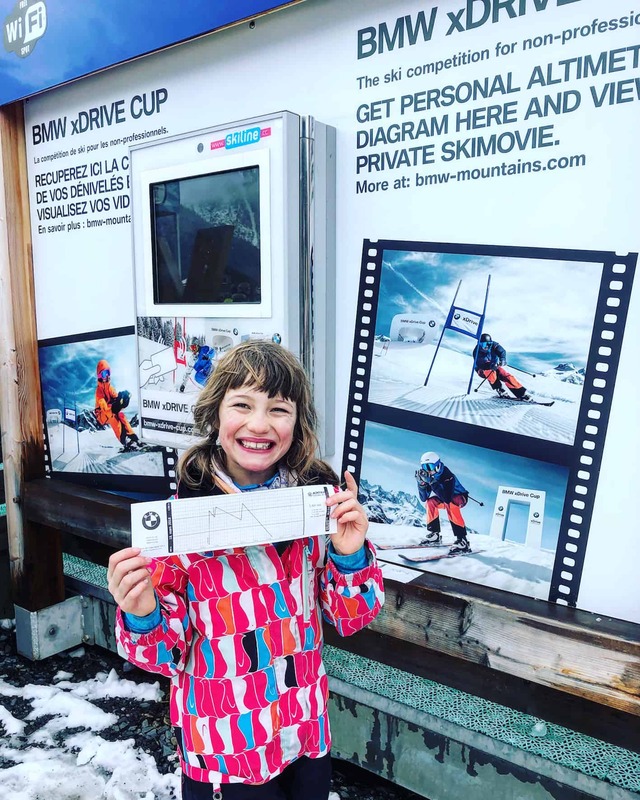 Beginners will love the gentle beginners area at the Prarion and more advanced skiers can try their hand on the famous world cup black run – the Kandahar. Les Houches is a quiet village spread out around the Maire, the Prarion and Bellevue. With a host of restaurants and accommodation, it’s perfect for families. You can easily stay in the village without needing to leave – the village has a large supermarket, petrol station, doctors, ski hire etc. Those wanting nightlife should head to Chamonix centre, a 10 minute drive away (see Les Houches to Chamonix section below). Access the Les Houches ski area by one of two lifts. The Bellevue Cable Car in the centre of Les Houches whisks you up in 5 minutes to the Bellevue plateau (1800m) or the Prarion gondola, further on through the village (7-10 minutes drive) takes you up to 1900m. Parking at Bellevue is limited and unless you arrive early, it’s best to head straight for the Prarion lift. Parking at both lifts is free but can be difficult to find a space in peak season if you arrive after 10am. There is a third option to get up to the Les Houches ski area by taking three chair lifts. It takes a bit longer (30 minutes in total) but if it’s peak season and you don’t want to queue then it’s a good way to get up. The first chair (Coupe du Monde) goes from the top car park at Bellevue to Maison Neuve. From there take the Maison Neuve chair which drops you at two restaurants – La Ferme and Le Hors Piste. You can then take the Kandahar 4 man chair to access the top of the Prarion plateau (1900m). The Prarion lift shunts you up to the epicentre of the ski area. 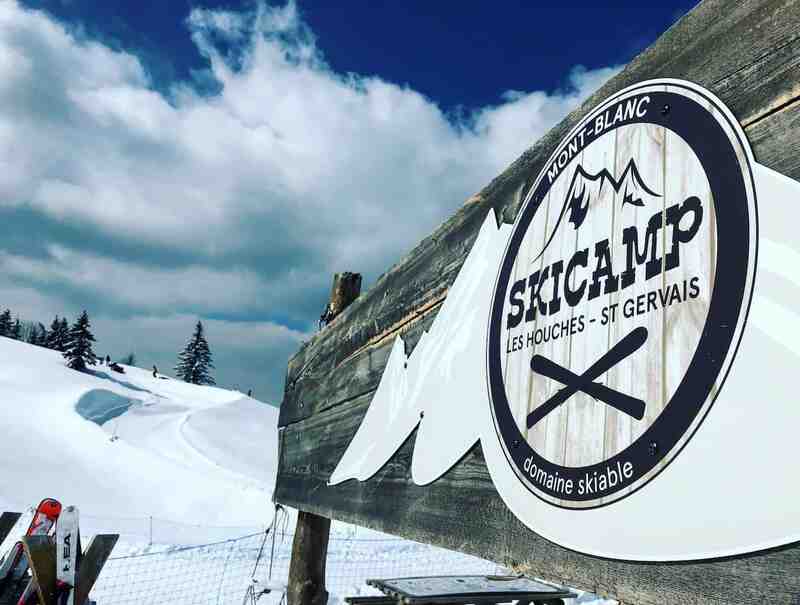 It’s here you’ll find the beginners slope accessed by the Ecole 4 man chair, lots of gentle blue graded pistes and the Ski Camp play area for kids. Five lovely broad blues meander tamely down through a ‘forêt du sapins’ on the Saint Gervais side of the mountain. 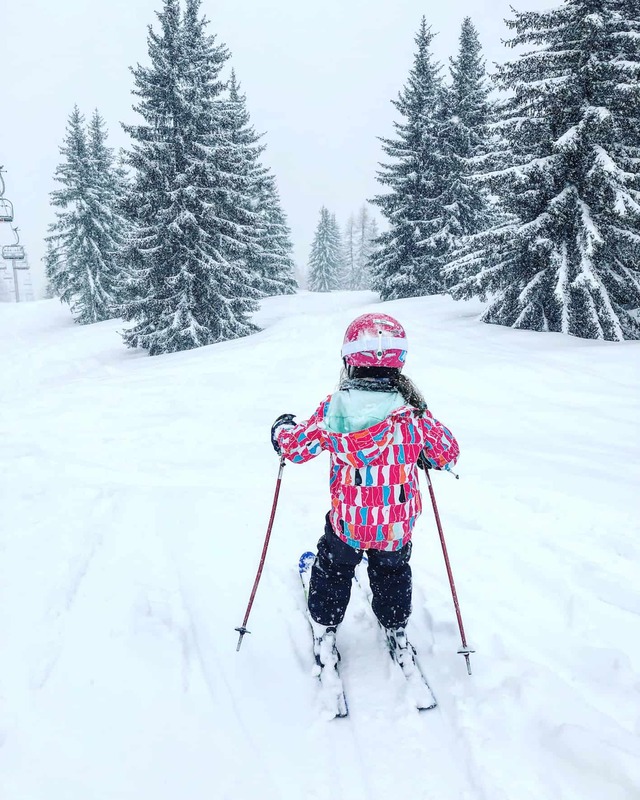 Perfect for families, progressing beginners or cruising intermediates these are perfectly mellow runs descending through magical snow covered fir forests. Snowboarders be prepared to flat line some areas or flat spots may catch you out. The Mélèze 4 man chair feeds you to most of the terrain this side, giving you an aerial view of the snowpark as it returns to to the plateau. The snowpark has two levels of difficulty for those wanting to get some air – S for simple (easy) or M for moyen (medium). The bordercross here is super tame with just a few rollers and no banks. Head over to the other bordercross beneath the Bellevue for a more challenging course. Choose from La Cha or Tetras for easy wide blues with gentle rollers on beautiful tree lined pistes. La Cha winds down past a restaurant of the same name which serves decent food (see Les Houches Restaurants section). 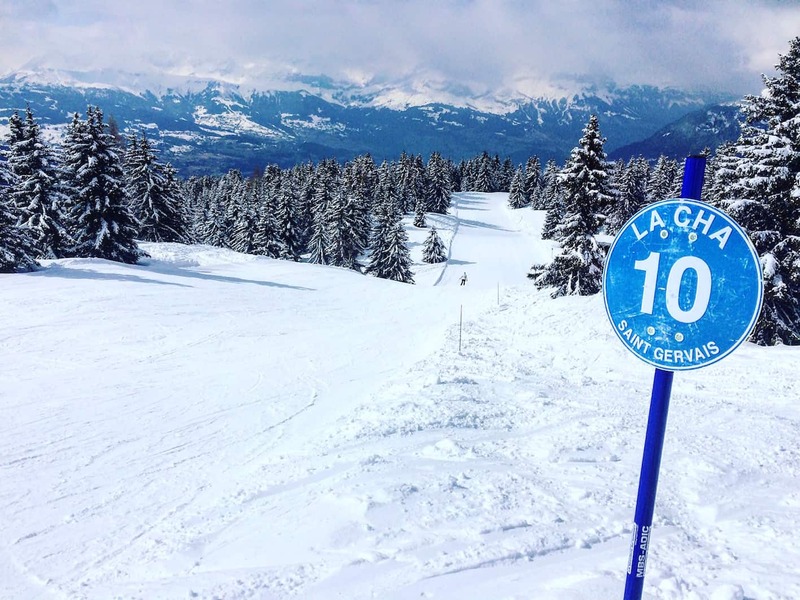 The Abbaye is a fantastic long blue run which curves round into an easy gentle section, more like a green graded piste round to the magic carpet at the Crozat four seater chairlift (1493m). Try riding under the middle section of Melezes chair in fresh powder – take left if coming up the lift and cut round to the snowpark. Follow the boarder cross (keeps your speed up to make the hill out) and carry straight on under the lift for some easy powder lines between the trees. Otherwise the Fontaines (below) red on the same side descends to the Crozat 4 man magic carpet chair lift. Heading from the Prarion plateau (1900m) the red Col de Voza (above) takes you down to the saddle of ski resort (Col de Voza 1650m) to both the hotel, the Mont Blanc Tramway station, and the charming La Rioule restaurant. Whilst the long red run Mur des Epines descends 620 vertical metres from the Bellevue side to the Maison Neuve 4 man chair lift. 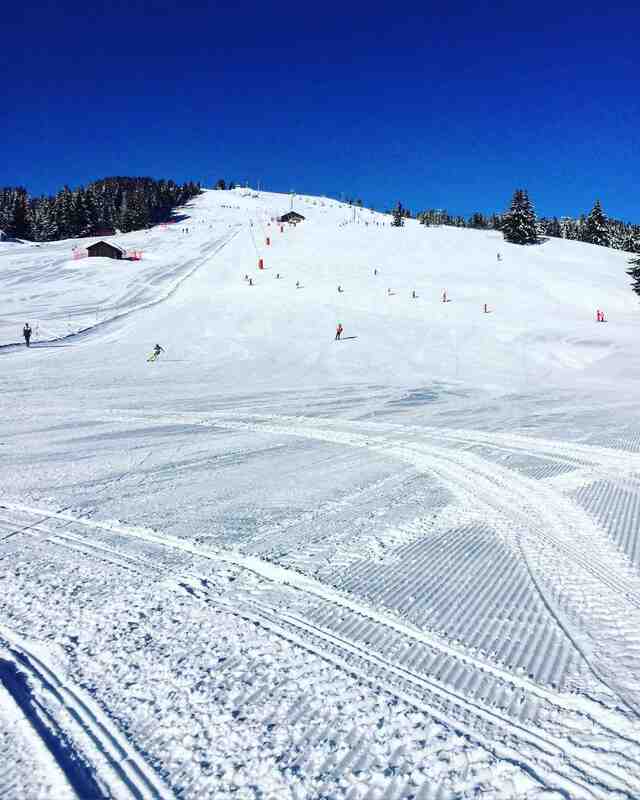 The Stade FIS is a challenging run from the beginners ski area. Both this and the red Table d’Orientation merge into the Rouge Maison Neuve red home run. With a vertical drop 900 metres, the home runs back to the village are fantastically long, and unlike any other ski mountain in Chamonix, Les Houches has not one but THREE different home piste gradients. 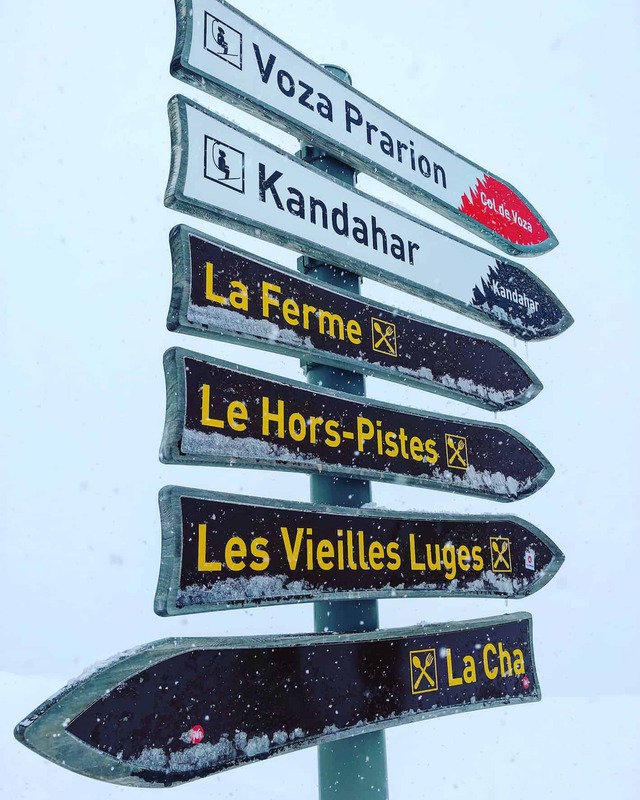 Take your pick from blue, red or black pistes to get you home. You can ski down to either car park, Bellevue or Prarion – look out for the split in the piste after skiing through the tunnel. We took the Aillouds piste, a nice easy blue winding from Prarion down to Col de Voza and past the bottom of the Kandahar chair. At around half way down, it can start to get a bit mogully (where it the Table d’Orientation red piste merges) but it’s a great run down and a lovely end to a day’s skiing. Bear in mind due to the low altitude of the village, the home runs may no longer be open for Spring skiing in April. The Tramway du Mont Blanc is a high mountain rack & pinion railway departing Le Fayet – St Gervais bringing sightseers up to the slopes as far as Bellevue. The ski camp area at Les Houches is fantastic for kids. This Haribo sponsored snow playground is perfect to keep the kids entertained after they’ve exhausted themselves skiing. Complete with teepees, eskimo drums, zip line and snowtubing, this free area is a haven for families. It’s situated a short walk from the arriving Prarion gondola and is well signposted. There’s also a sledging piste here, which you’ll walk down to get to the Ski Camp. There are two snowtubing tracks to choose from. One banked course which snakes down and around and one vertical drop course which is much faster. It’s well laid out and has grip pads to secure the snowtubes at the top of the piste whilst you’re climbing in. 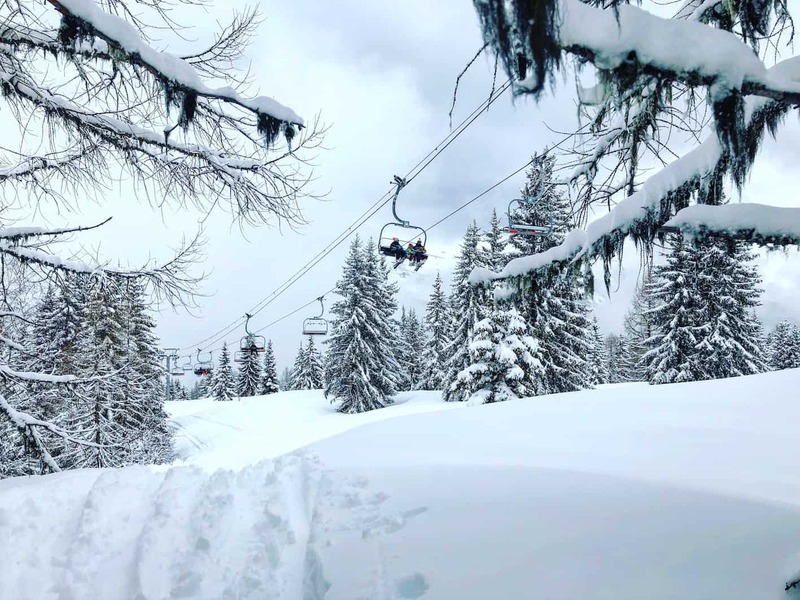 Here in Les Houches its possible to have the unusual experience of skiing next to a charming high mountain train, the Mont Blanc Tramway, which chugs sightseers up to the ski resort from Le Fayet – St Gervais on the other side of the mountain. A surreal experience as tourists wave as skiers whizz by. From this year Les Houches ski passes have the Tramway du Mont Blanc included. We would definitely recommend you try to fit it into your day/week. 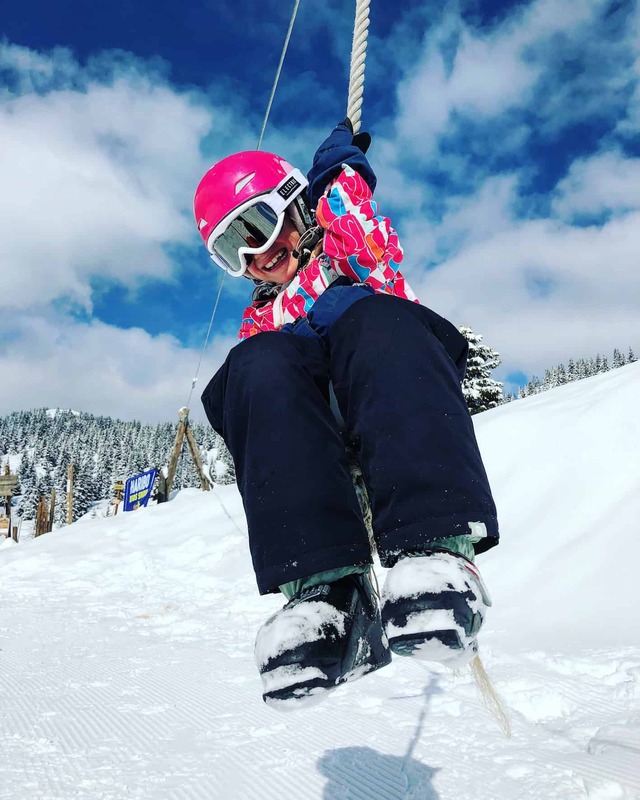 It’s a great way to break up a skiing day for kids, to escape the wind or cold on bad weather days or for non-skiers in your group to access the area. Kids love it! 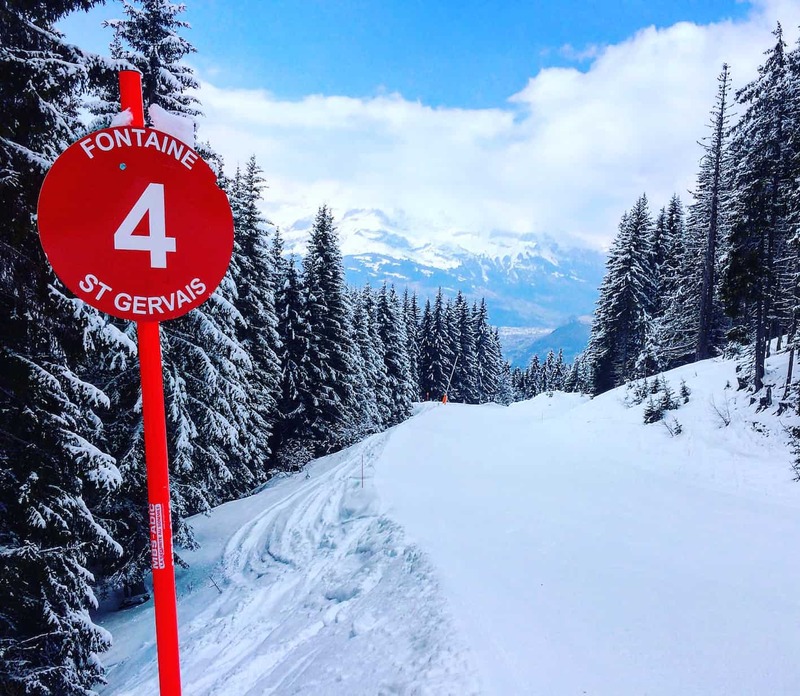 If you’re staying in St Gervais, you can come up to the Les Houches ski resort via the tram. 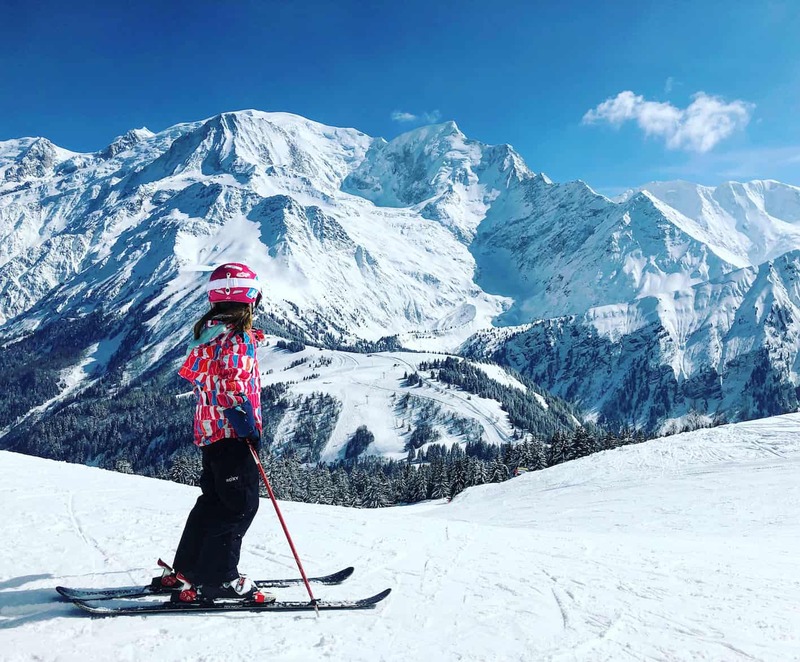 If you’re already skiing, take the train from the Col de Voza up to Bellevue (for a 2 minute ride) or down the valley to Le Fayet – St Gervais and back up. Many people wonder whether Chamonix is good for beginners. Les Houches is an excellent place to head for if you’re a beginner skier. Take the Prarion lift to access the dedicated beginner area with the Ecole 4 seater chair. 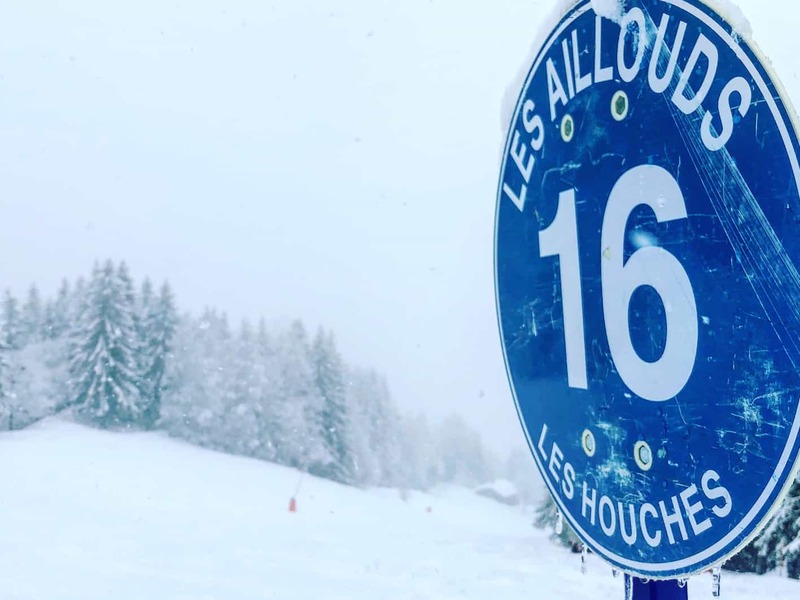 With plenty of easy blue pistes, Les Houches is much less intimidating than the rest of the valley and a great place for beginner skiers to progress up from the Espace Debutant. In the village there is also a beginners slope Le Torchon, next to the outdoors ice rink (patinoire). 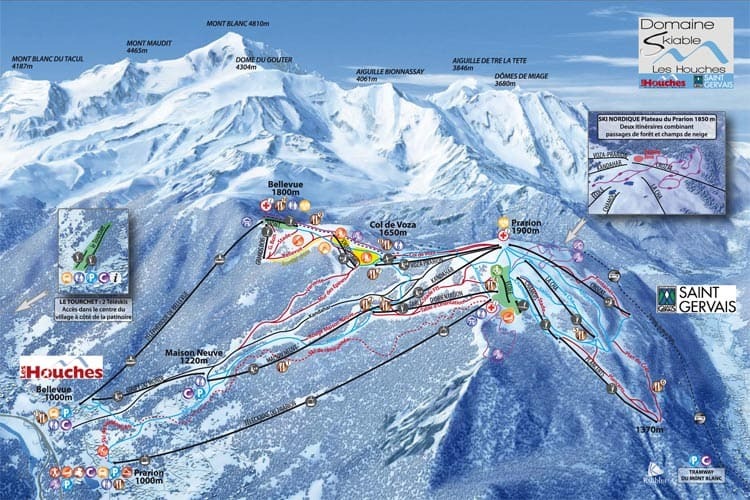 Le Torchon has two drag lifts and is a great beginners area which very reasonable daily pass tariffs. Les Houches is renowned in the valley for being excellent on bad weather days. Because so many of Les Houches’s runs are in the trees, it’s a great place to ski when visibility is low. Also if there have been high amounts of snow falling, and avalanche risk is high, many or sometimes all of the other Chamonix lifts may be closed. This is when Les Houches champions. It is rarely closed. Prarion has an altimeter which is a real novelty (the kids love it!) to print out your stats for the day. The altimeter is activated by simply swiping your pass after coming down the mountain (no need to do it on the way up). The altimeter can track your movements from your pass and prints out your stats into a pleasing chart of zig zags indicating your altitude against time, which lifts you took, how many kilometres skied and how many minutes of fun you were up the mountain. Note: this is only at Prarion, not Bellevue, but we have been known to drive up to Prarion after descending Bellevue just to get our print out! Les Houches, unlike the rest of the Chamonix’s ski mountains, have retained their charming authentic mountain side restaurants. 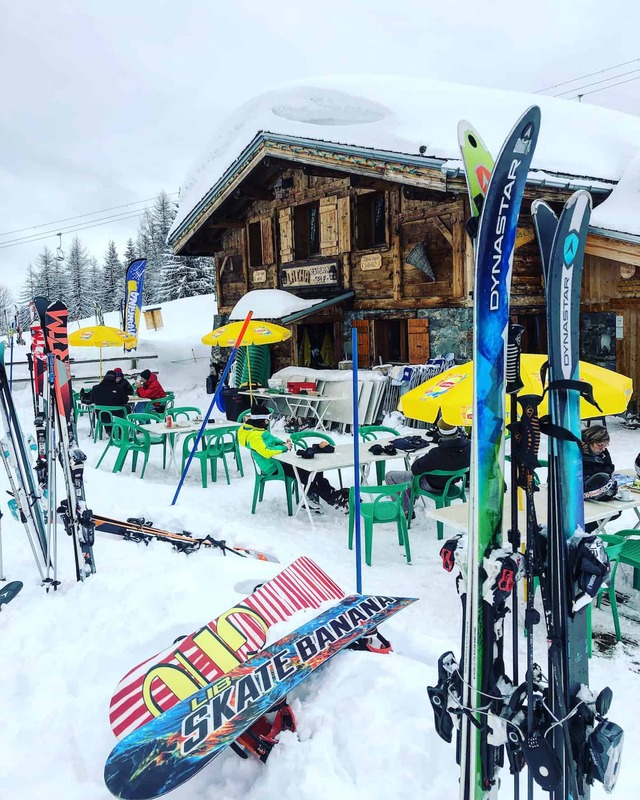 With a whopping ten mountain restaurants to choose from (more than all the other ski mountains in Chamonix put together! ), lunching on the mountain has never been so easy. Our favourite is the tiny La Rioule, tucked away on the other side of the rail tracks on the Col de Voza saddle (1650m). It’s not even signposted on any of the ski resorts signage but seek it out and you won’t be disappointed. Make sure to book in peak times this cosy restaurant with a roaring fire only seats 26 people. La Rioule serves delicious Savoyarde food. Choose from tasty croutes, fondue, platters of local cured meats and cheese, omlettes and gaufres. No chips! Open every day. Book the day before or early morning the same day for lunch. La Rioule Restaurant rents snowshoes for the incredible price of €5 a day. There are three official snowshoe (raquette) trails in the Les Houches ski area. One trail starts right from La Rioule restaurant on the Col de Voza (1650m) climbing up to Bellvue (1800m) zigzagging parallel to the train tracks and gives stunning views of Mont Blanc. La Cha Restaurant on the La Cha blue piste on the St Gervais side serves good hot self service food and reasonably priced drinks. (chips €7). There’s also a picnic area for packed lunches. La Cha has pumping music outside on hot sunny afternoons with an alfresco shack selling hotdogs & fast food takeaway snacks. 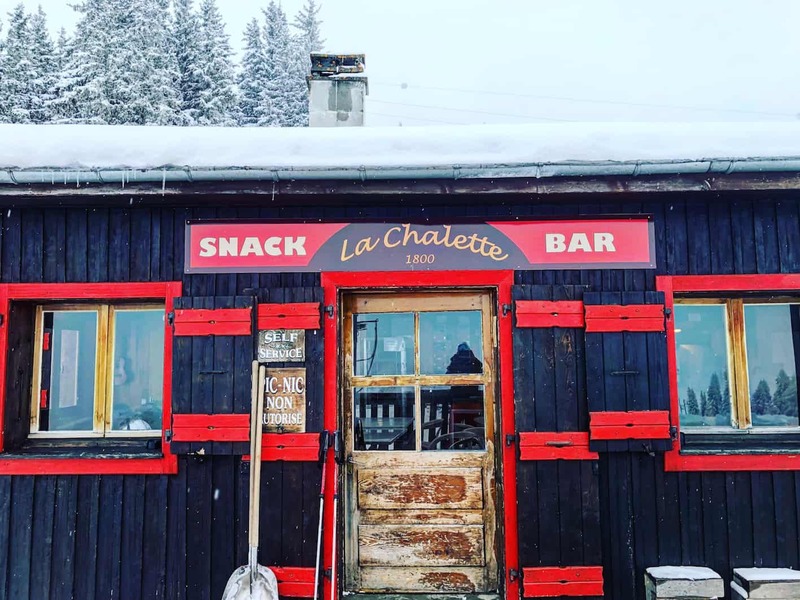 La Vieilles Luge is a Savoyarde restaurant housed in a wonderfully rustic 250 year old farm building on the lower ski slopes of Les Houches. It’s imperative to book ahead for lunch and it’s also possible to eat dinner here on certain nights (call for more information). In off peak season it tends to only open at weekends. La Vieilles Luge restaurant is located just off the blue Aillouds home run. You’ll see a small sign and path leading off from the left side of the piste where the red Rouge Maison Neuve piste joins the Aillouds. 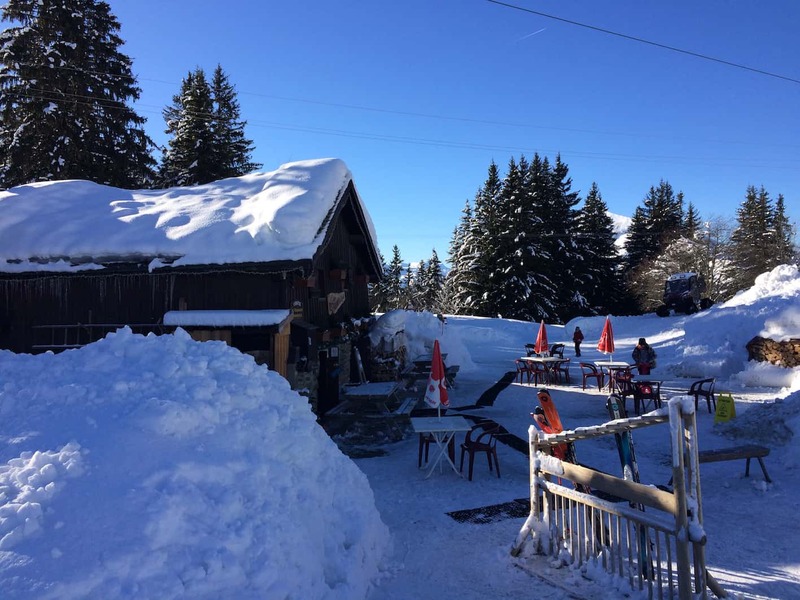 It’s also slap bang on the Ski de Randonnée (skinning up trail) which starts from the bottom of the Prarion, which means you can either snowshoe or skin up the trail in the dark to eat here in the evenings. This snack bar at the top of the Bellevue cable car is a cosy place perfect for a warm drink or a quick snack. The Les Houches ski pass is much cheaper than either the Chamonix Le Pass or the Mont Blanc Unlimited passes. It obviously only includes all the Les Houches lifts but does from this year include the Tramway du Mont Blanc (see above). If you want to ski other areas in Chamonix as well as Les Houches, or if you visit some of the high altitude sightseeing lifts (Aiguille du Midi or the Montenvers train) then consider the Mont Blanc Unlimited pass which includes all the ski areas, all the lifts, as well as access to Courmayeur in Italy (a 20 minute drive from Chamonix through the Mont Blanc tunnel), Verbier in Switzerland and Les Contamine/St Gervais. 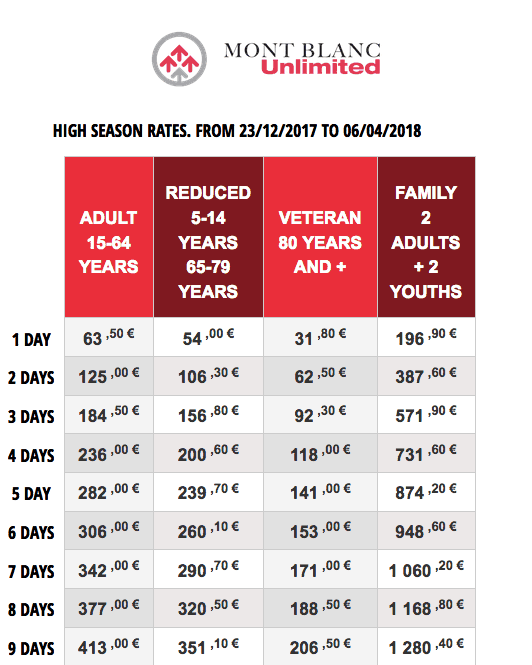 See both the Les Houches and Mont Blanc Unlimited ski pass prices for 17/18 below. For any advance purchase 3 days minimum before your arrival, take advantage of a free day. Example: buy 6 days and pay only for 5 ! There are plenty of ski hire options in Les Houches village. Slap bang in the car park at Bellevue is Inter Sport, on the road to the Prarion is Cyprien Sport. Sport 2000, opposite the outdoor ice skating rink (Patinoire) and the beginner slope Le Torchon in the village. Sport 2000 are super friendly and we highly recommend them for their range of services and their low prices. You can order your skis in advance and they’ll drop them off at your accommodation. You can also buy your lift tickets in the store. Cyprien Sports is owned by a local family and has the Ski Muim franchaise. Located on the main Les Houches road near to Bellevue, the shop has plenty of private parking for customers next door. Prices are competitive with Sport 2000. Can book online and collect in-store. Opening hours are more restrictive with week day closing for 2 hours at lunchtime, although non-stop over Christmas. Open Mon – Fri 8.30 – 12.00 / 14.00 – 19.00 Sat & Sun 8.30 – 19.00 non stop! Les Houches is less than a 10 minute drive from the centre of Chamonix if you have your own car or hire car. Buses run every half an hour from Le Prarion. It takes 25 minutes to get from Le Prarion to Chamonix centre and the bus is free if you have a lift pass. The 01 route bus stops at all the stops in Les Houches (Le Fouilly, Bellevue, Les Houches Marie, La Griaz-Le Torchet, Saint Antoine, Les Granges and Le Pont) before continuing along the valley to Chamonix. The 03 route bus also goes to Chamonix. The last 01 bus leaves Le Prarion at 20.20. A night bus service starts from 21.15 & costs €2 one way. For more information on Chamonix buses and to download a bus timetable click here. CVT (Chamonix Valley Transfers) offers a taxi service up until 1am around the valley. For up to 8 people from Chamonix to Les Houches the cost is €45. You must pre-book on 00 33 (0) 4 85 80 01 32. 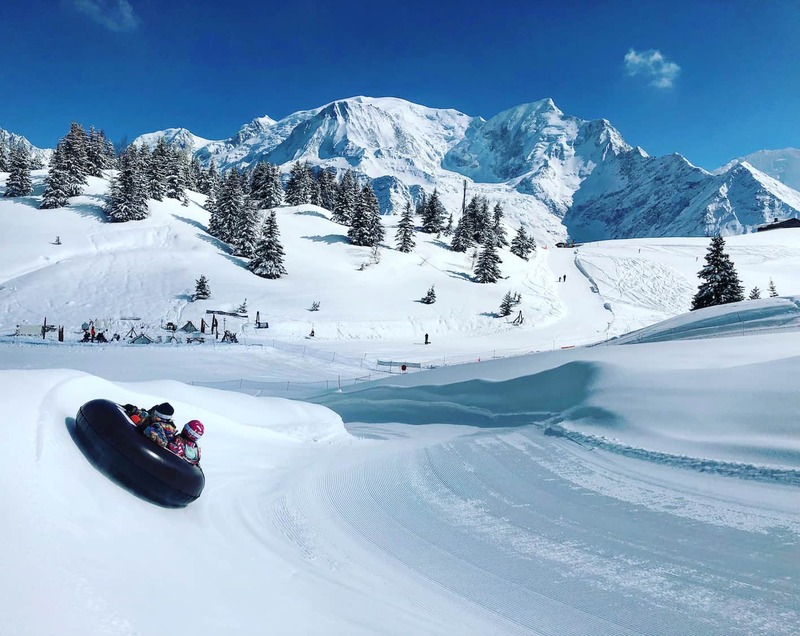 It takes around an hour to transfer from Geneva to Les Houches, so it’s a great option when travelling with kids, over resorts such as Tignes which have a long, tiring transfer journey after the flight. From Geneva airport, either organise a direct resort transfer through one of Chamonix’s many transfer companies. We recommend CVT (Chamonix Valley Transfers) or Mountain Drop Offs who drop you door to door. Both cost around €35 one way from Geneva airport to Chamonix in a shared 8 man mini bus. Both companies provide booster seats or baby car seats on request. Easy Bus does cheap transfers direct to Chamonix bus station in the centre of town from £11.99 one way, but does not do door to door. Yes it’s cheap but it’s not 100% reliable. Buses go on the hour but sometimes never turn up. If you’re making the return journey to the airport and want to go with Easy Bus ALWAYS take the bus before the bus you actually need. 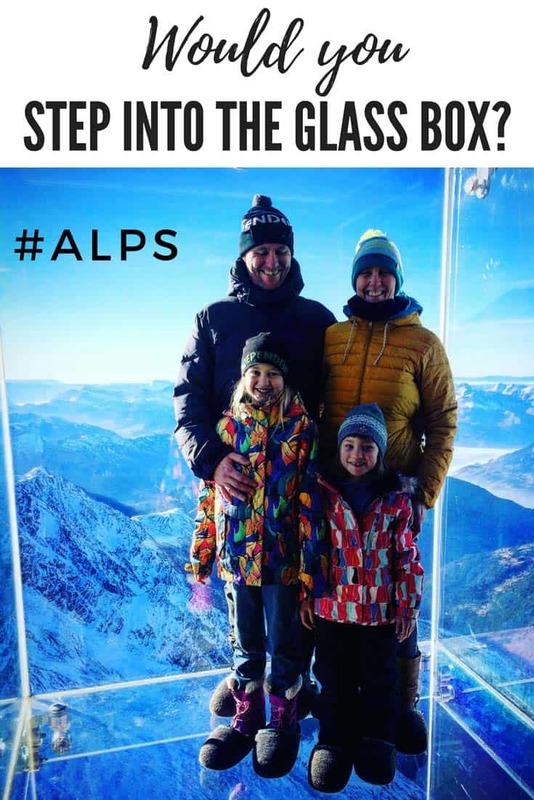 Chamonix has always been so high on our bucket list! And yet because we aren’t into ski, we never really looked into it because we were afraid we’d get bored to death. Now I know that we could visit Les Houches, it sounds like the kind of quiet village that we’d appreciate. It’s also good that you won’t have to drive around because there are all the things you need! Les Houches is my kind of ski resort! I’m so glad I stumbled upon your review because Chamonix ski resorts have always been a bit intimidating to me. Now I know that I’ll be fine at Les Houches as a “forever beginner”. And there are lots to keep my son engaged too. He’d love to try snow tubing. I’ll head to La Vieilles Luge for a long lunch while he and my husband try the red and black slopes. Great tip to take a break in between ski days with an outing on the Mont Blanc tramway. Wide runs without crowds or pretense? Sign me up! I’m an intermediate skier at best and I would be more than happy at Les Houches. I have never tried skiing my entire life, but I have to admit, the photos make me want to try it. Snowtubing and the Tramway seems like great experiences! Jenn (my wife and lovely partner) has always wanted to go to Chamonix. She was a combination of ski instructor and pro-patrol on some of the steepest mountains in America, until her knee replacement took her out of the game. I can imagine going to Les Houches so she can finally check Chamonix off her bucket list without killing or injuring either of us. We have wildly differing opinions of the value of staying on the groomer vs the gnarly steeps. I think there is a nobility in living to fight another day. I have been to Chamonix but because I am not much of a skier (I have been thinking of learning it) I did not research visiting any ski resorts. We took the ropeway up to the peaks and it was in the summer and it was a lovely experience! 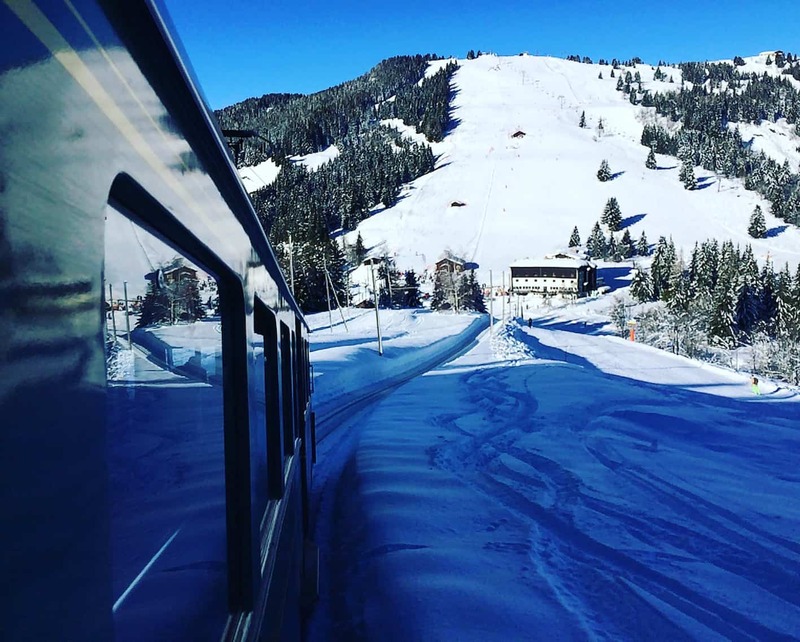 Mountain railways are amazing and to be able to ski close to the railways and in such a beautiful place must be a truly rewarding experience. Your pictures of this winter wonderland are inspiring serious wanderlust in me! Thank you so much for the excellent and detailed information. My family found it very helpful during our trip to Les Houches. 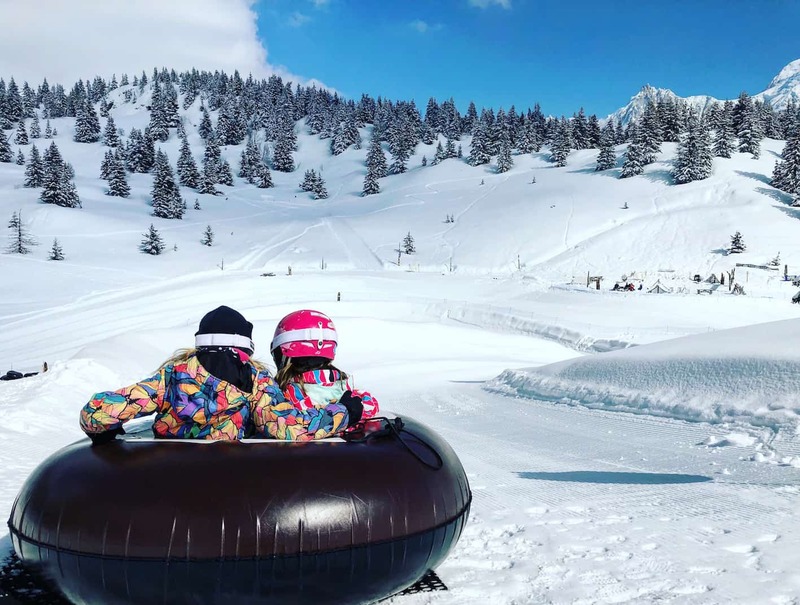 I’m so happy to have found your site (as I was researching Les Houches) as it has many great ideas and tips that I think will be very valuable for our family as plan other trips. Keep up the great work!